Sharon Kingen, Ruby Smith, Jim Bondurant and Mary Bondurant Warren arrived in Kentucky early before the 2005 annual meeting in order to visit the Kentucky Archives and Kentucky Historical Society at Frankfort. We even met a Bondurant descendant, Dan Peyton, an employee of the Kentucky Historical Society. We received a warm reception from their helpful staffs, and came away with some real surprises to share with you. Ms. Sarah Dean of the Kentucky Archives Research Room, and Ms. Kandie Adkinson of the Secretary of State Land Office found documentation we needed to fill in the land titles for David and John Peter Bondurant, but were getting ahead of the story. Daniel Boone was born 1734 in Olney Township, Pennsylvania. The Exeter Meeting [Quakers] had warned his father, Squire Boone, when several Boone children “married out of unity” – non-Quakers. In 1748 Squire was “disowned” [excommunicated] by the Society of Friends [Quakers] in Exeter, PA. Squire sold their family farm in 1750 and the family began their journey into the Shenandoah Valley. After living for a time in a cave on the north fork of the Yadkin River, now Davidson Co., NC, Squire Boone obtained a land grant from Lord Granville for 640 acres between Elisha and Dutchman’s Creeks, and then a second grant on Bear Creek, in Davie Co. The Boone family had hardly settled on their North Carolina lands when the French and Indian War began (1755) and Daniel joined Major Edward Dobbs’ North Carolina militia company, and served as a wagoner in British Gen. Braddock’s march and defeat at Fort Duquesne. George Washington served as guide to Braddock, and had advised against the attack! In 1756 Daniel married Rebecca Bryan, and settled in Rowan Co., NC, where they took in his four nieces and nephews, orphans of brother Israel Boone. In 1765 Daniel and several others explored Georgia’s lands south of the Altamaha, and even went to Florida. Daniel bought a lot near Pensacola, West Florida, on this trip, but never went back to it. By 1767 Daniel and others were exploring the Watauga area of East TN. then they went across the Blue Ridge and the Clinch Rivers to Big Sandy River, where they built a camp, near present Prestonburg, KY. In 1769, with John Findlay as his guide, Daniel and four others went through the Cumberland Gap and into Kentucky. While hunting in Kentucky, Daniel was captured by the Shawnee Indians, but escaped in 1771 and returned home to the Yadkin River in NC. He moved his family to a homestead near Sapling Grove, TN, in 1772. In 1773 Daniel leads several families towards KY, but they are attacked by Indians, and return to settle on the Clinch River in TN. Lord Dunmore’s War began in 1774, and the Clinch River settlement is under attack by the Indians. Late in the year, after the Battle of Point Pleasant the Shawnee Indians are defeated, and sue for peace. In 1775 Richard Henderson forms the Transylvania Company, and Daniel Boone acts as their agent to purchase land from the Cherokee Indians. Daniel and others begin to mark the Wilderness Road from Long Island on the Holston River towards to KY. The Shawnees again attack the settlers, but Boone and his companions build a fort at Boonesborough, KY by the first of May 1775. The American Revolution began. In 1776 Boonesborough was again attacked by Indians. That summer Daniel’s daughter Jemima and two daughters of Col. Richard Callaway, were captured by the Shawnees, but rescued two days later. Another Indian attack was made on Boonesborough in April 1777, and Daniel was wounded. Settlers continue to come into the area. In January 1778 Daniel led a party of 26 men to the Lower Blue Licks to boil salt. He was captured in February by the Shawnees, but escaped and returned to Boonesborough in June. September 1778, under the guise of signing a peace treaty with the whites, the Shawnees gather at Fort Boonesborough. They besieged the fort from 7th to 18th September, but the settlers held on, with only two casualties – DAVID BONDURANT, and London, a male slave of Col. Richard Callaway. 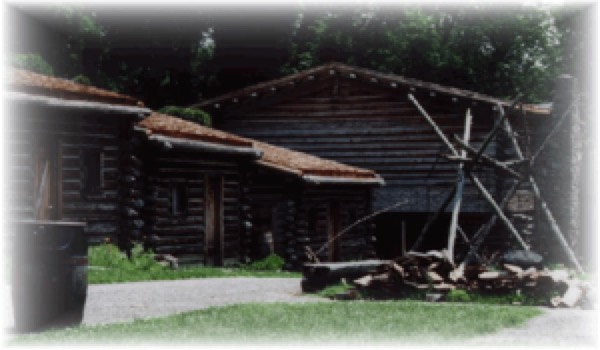 In the fall of 1779 Boone led a group of settlers from NC into KY, and they established a new settlement six miles northwest of Boonesborough which they called Boone’s Station. While in Richmond, VA, in 1780, Daniel Boone was robbed of $20,000 in depreciated Continental scrip, and land certificates (including one from “JOHN BUNDRUM”). 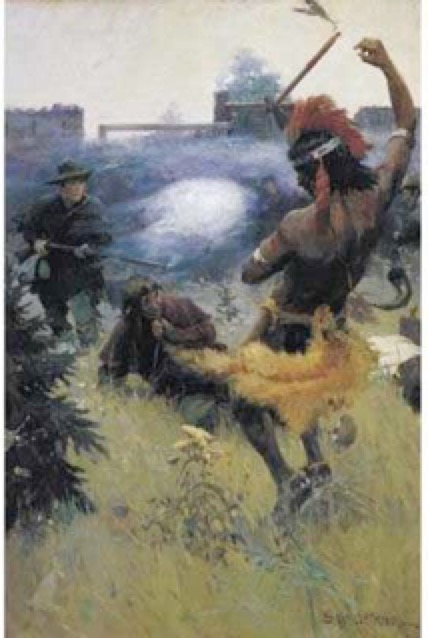 Now we switch from the life story of Daniel Boone to that of the one white casualty in the 1778 attack by the Shawnees on Boonesborough – David Bondurant. Kentucky in 1778 was Kentucky District, VA, so its earliest records can be found preserved in the Virginia Archives at Richmond. 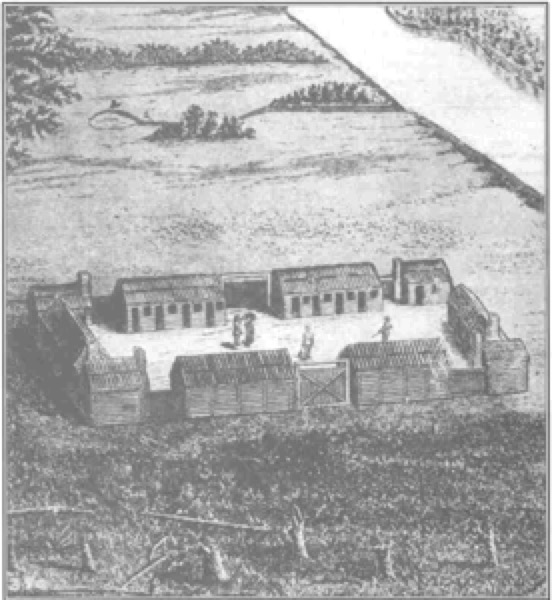 David Bondurant had come into Kentucky District, and had made a settlement in February 1778 on “Tate’s Creek about three miles from the mouth thereof including the Walnut Bottom,” an area now part of Lexington, KY.
Indians made repeated attacks on small settlements of whites, and with the impending peace treaty with the Shawnees, we presume that David and his wife had gone to Fort Boonesborough to witness the signing. Their home was some miles to the northwest of the fort. These eyewitness accounts collected by John Filson, and documents gathered by Lyman Draper, give a graphic account of the siege of Boonesborough. Another tragic event occurred during that busy and exciting night. While DAVID BUNDRIN, a Dutchman who was posted in the south-west bastion, was looking through a port-hole partly closed with a stone, a ball struck close and split, one half penetrating his forehead, producing a mortal wound and rendering him speechless. Bundrin was a good soldier and had been wounded in the thigh when at work in the field the preceding spring . Draper had discovered John Filson’s interviews with survivors of that Boonesborough siege, and built this narrative from Filson’s interview of John Gass, and others. What came as a surprise was that Gass described David Bundrin [Bondurant] as “a Dutchman” and MARRIED. The quote of David’s wife’s comment, in broken English with a German usage, further suggests that it was Mrs. David Bundrin, who is not named further in the interview, who was “Dutch” – at that time the colloquial reference to a German-speaking person, not just a person from Holland. The Valley of Virginia had a number of settlements of German-speaking citizens who had moved south-westward from Pennsylvania, and may have formerly been “Pennsylvania Dutch.” Was David’s wife one of them? Might their marriage be found recorded in one of the early church registers or record books; perhaps his surname was mis-spelled, and we’ve missed it in transcriptions and indexes. The marriage would almost certainly have been performed by the minister or in the Meeting to which SHE belonged, and this should provide her name, and possibly parentage. Calling David a “good soldier” suggests that he may have seen some military service, possibly earlier in the Revolution, or in the French and Indian War. Has anyone seen documentation? I have not; Clint, have you? All able bodied white males 16 to 45 were required to do militia service in their home county four days a year for drilling, and when called out by the Governor. While this might be considered military service, would David’s contemporary have referred to his appearance at militia musters as making David a good soldier? Since the settlement made by David Bondurant lay in the Kentucky District of Virginia, inheritance of his land would be governed by Virginia law. Hening’s STATUTES AT LARGE ... OF VIRGINIA, vol. 9, pages 355-56. October 1777. Had David and his widow had children, his preemption would have passed to the widow and children. That the claim was awarded to JOHN PETER BONDURANT, if David died intestate (as he probably did), suggests that J.P.B. was David’s father. 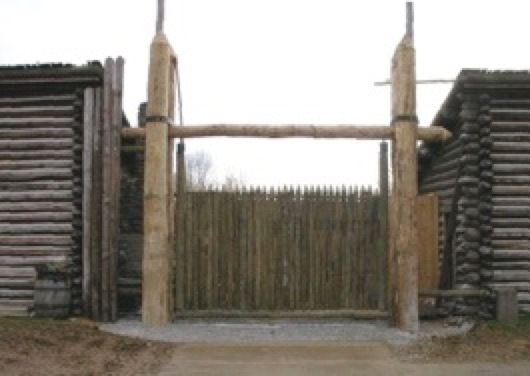 Fort Booneborough State Park has a reconstructed copy of original Fort where the Siege took place.